Mix almond meal and baking powder together. Add eggs and oil, mix well. Spray a small square microwave safe container with cooking spray. Microwave on high for about 2 minutes till bread has risen and is dry and firm when touched. Cut into 4 slices, share and enjoy. 76 members have added this recipe to their cookbook. 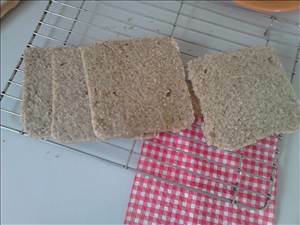 There are 316 calories in 1 serving of Paleo Sandwich Bread. Calorie Breakdown: 77% fat, 10% carbs, 13% prot.